Fraser, L.H., Pither, J., Jentsch, A., Sternberg, M., Zobel, M., Askarizadeh, D., … Zupo, T. (2015). Worldwide evidence of a unimodal relationship between productivity and plant species richness. Science, 349(6245), 302–305. Link. Hudson, N.H., Newbold, T., Contu, S., Hill, S.L.L., Lysenko, I., … Fraser, L.H., … Purvis, A. (2017). The database of the PREDICTS (Projecting Responses of Ecological Diversity In Changing Terrestrial Systems) project. Ecology and Evolution, 7(1), 145–188. Link. Henry, H.A.L., Abedi, M., Alados, C.L., Beard, K.H., Fraser, L.H., Kreyling, J., … Yang, X. (2018). Increased soil frost versus summer drought as drivers of plant biomass responses to reduced precipitation: Results from a globally coordinated field experiment. Ecosystems, 1–13. Link. Garris, H.W., Baldwin, S.A., Taylor, J, Gurr, D.B., Denesiuk, D.R., Van Hamme, J.D., & Fraser., L.H. (2018). Short-term microbial effects of a large-scale mine-tailing storage facility collapse on the local natural environment. PLOS ONE, 13(4), e0196032. Link. Antonelli, P.M., Fraser. L.H., Gardner, W.C., Broersma, K., Karakatsoulis, J., & Phillips, M.E. (2018). Long term carbon sequestration potential of biosolids-amended copper and molybdenum mine tailings following mine site reclamation. Ecological Engineering, 117, 38–49. Link. Antonelli, P.M., Fraser, L.H., Gardner, W.C., Broersma, K., Karakatsoulis, J., & Phillips, M.E. (2018). Long term carbon sequestration potential of biosolids-amended copper and molybdenum mine tailings following mine site reclamation. Ecological Engineering, 117, 38–49. Link. Garris, H. W., Baldwin, S. A., Taylor, J., Gurr, D. B., Denesiuk, D. R., Van Hamme, J. D., & Fraser, L. H. (2018). Short-term microbial effects of a large-scale mine-tailing storage facility collapse on the local natural environment. PLOS ONE, 13(4), e0196032. Link. Harrower, W.L., Srivastava, D.S., McCallum, C., Fraser, L.H., & Turkington, R. (2017). Temperate grassland songbird species accumulate incrementally along a gradient of primary productivity. PLOS ONE, 12(10), e0186809. Link. Harrison, R.B., Jones, W.M., Clark, D., Heise, B.A., & Fraser, L.H. (2017). Livestock grazing in intermountain depressional wetlands: Effects on breeding waterfowl. Wetlands Ecology and Management, 25(4), 471–484. Link. Richardson, H.J., Hill, D.J., Denesiuk, D.R., & Fraser, L.H. (2017). A comparison of geographic datasets and field measurements to model soil carbon using random forests and stepwise regressions (British Columbia, Canada). GIScience & Remote Sensing, 54(4), 573–591. Link. Knapp, A.K., Avolio, M.L., Beier, C., Carroll, C.J. W., Collins, S.L., … Fraser, L.H., … Smith, M. D. (2017). Pushing precipitation to the extremes in distributed experiments: Recommendations for simulating wet and dry years. Global Change Biology, 23(5), 1774–1782. Link. Potvin, C., Sharma, D., Creed, I., Aitken, S., Anctil, F., … Fraser, L.H., … Wright, T. (2017). Stimulating a Canadian narrative for climate. FACETS, 2(1), 131–149. Link. Hudson, L. N., Newbold, T., Contu, S., Hill, S. L. L., Lysenko, I., … Fraser, L.H., … Purvis, A. (2017). The database of the PREDICTS (Projecting Responses of Ecological Diversity In Changing Terrestrial Systems) project. Ecology and Evolution, 7(1), 145–188. Link. Densmore-McCulloch, J.A., Thompson, D.L., & Fraser, L.H. (2016). Short-term effects of changing precipitation patterns on shrub-steppe grasslands: Seasonal watering is more important than frequency of watering events. PLOS ONE, 11(12), e0168663. Link. Fraser, L.H., Cahill., J.F., & Lortie, C.J. (2016). Roy Turkington and his legacy to the science of plant ecology. Plant Ecology, 217(11), 1291–1295. Link. Fraser, L.H., Garris, H.W., & Carlyle, C.N. (2016). Predicting plant trait similarity along environmental gradients. Plant Ecology, 217(11), 1297–1306. Link. Kreuter, U.P., Iwaasa, A.D., Theodori, G.L., Ansley, R.J., Jackson, R.B., Fraser, L.H., … Moya, E.G. (2016). State of knowledge about energy development impacts on North American rangelands: An integrative approach. Journal of Environmental Management, 180, 1–9. Link. Nazeri, V., Nourbakhsh, F., Sabzalian, M.R., Fraser, L.H., Donkor, K., Sepehri, M., … Gardner, W. (2016). Interactions between microorganisms and plant genotype affect soil carbon under drought conditions. Proceedings of the 10th International Rangeland Congress, 913-914. Link. Veresoglou, S.D., Rillig, M.C., Fraser, L.H., & Halley, J.M. (2016). The influence of sampled biomass on species-area relationships of grassland plants. New Phytologist, 211(2), 382–385. Link. DeSandoli, L., Turkington, R., & Fraser, L.H. (2016). Restoration of slash pile burn scars to prevent establishment and propagation of non-native plants. Canadian Journal of Forest Research, 46(8), 1042–1050. Link. Garris, H.W., Baldwin, S.A., Van Hamme, J.D., Gardner, W.C., & Fraser, L.H. (2016). Genomics to assist mine reclamation: A review. Restoration Ecology, 24(2), 165–173. Link. Pither J., Fraser, L.H., Jentsch A., Sternberg, M., Zobel, M., Cahill, J., … Zupo, T. (2016). Response to Comment on ‘Worldwide evidence of a unimodal relationship between productivity and plant species richness. Science, 351(6272), 457–457. Link. Wang, H-F, López-Pujol, J., Ross Friedman, C., Fraser, L.H., & Huang, G-H. (2015). Plant species and communities in Poyang Lake, the largest freshwater lake in China. Collectanea Botanica, 34, e004. Link. Fraser, L.H., Partel, M., Pither, J., Jentsch, A., Sternberg, M., & Zobel, M. (2015). Response to Comment on “Worldwide evidence of a unimodal relationship between productivity and plant species richness.” Science, 350(6265), 1177–1177. Link. Fraser, L.H., Harrower, W.L., Garris, H.W., Davidson, S., Hebert, P.D.N., Howie, R., … Wilson, D. (2015). A call for applying trophic structure in ecological restoration. Restoration Ecology, 23(5), 503–507. Link. Cox, M., Gardner, W.C., & Fraser, L.H. (2015). A survey-based assessment of cattle producers’ adaptation to climate change in British Columbia, Canada. 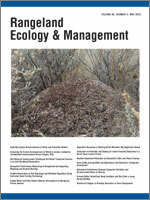 Rangeland Ecology & Management, 68(2), 119–130. Link. Garris, H.W., Mitchell, R.J., Fraser, L.H., & Barrett, L.R. (2015). Forecasting climate change impacts on the distribution of wetland habitat in the Midwestern United States. Global Change Biology, 21(2), 766–776. Link. Hudson, L.N., Newbold, T., Contu, S., Hill, S.L.L., Lysenko, I., … Fraser, L.H., … Purvis, A. (2014). The PREDICTS database: A global databse of how local terrestrial biodiversity responds to human impacts. Ecology and Evolution, 4(24), 4701–4735. Link. Bassett, R.L. & Fraser, L.H. (2015). Effects of cattle on the abundance and composition of carabid beetles in temperate grasslands. Journal of Agricultural Studies, 3(1), 36–47. Link. Fraser, L.H., Jentsch, A., & Sternberg, M. (2014). What drives plant species diversity? A global distributed test of the unimodal relationship between herbaceous species richness and plant biomass. Journal of Vegetation Science, 25(5), 1160–1166. Link. Carlyle, C.N., Fraser, L.H., & Turkington, R. (2014). Response of grassland biomass production to simulated climate change and clipping along an elevation gradient. Oecologia, 174(3), 1065–1073. Link. Fraser, L.H., Mulac, K., & Moore, F.B.-G. (2014). Germination success of 14 freshwater wetland plants as affected by oxygen and light. Aquatic Botany, 114: 29–34. Link. Öpik, M., de Bello, F., Price, J.N., & Fraser, L.H. (2014). New insights into vegetation patterns and processes. New Phytologist, 201(2), 383–387. Link. Teuber, L.M., Hölzel, N., & Fraser, L.H. (2013). Livestock grazing in intermountain depressional wetlands — Effects on plant strategies, soil characteristics and biomass. Agriculture, Ecosystems & Environment, 175, 21–28. Link. Gilbert, A.A., & Fraser, L.H. (2013). Effects of salinity and clipping on biomass and competition between a halophyte and a glycophyte. Plant Ecology, 214(3), 433–442. Link. Folkard, P., Fraser, L.H., Carlyle, C.N., & Tucker, R. (2012). Forage production potential in a ponderosa pine stand: Effects of tree spacing on understory plants after 45 years. Journal of Ecosystems and Management, 13(3), 1–14. Link. Patrick, L.B., Fraser, L.H., & Kershner, M.W. (2008). Large-scale manipulation of plant litter and fertilizer in a managed successional temperate grassland. Plant Ecology, 197(2), 183–195. Link. Carlyle, C.N., & Fraser, L.H. (2006). A test of three juvenile plant competitive response strategies. Journal of Vegetation Science, 17(1), 11–18. Link. Fraser, L.H., Bradford, M.E., & Steer D.N. (2003). Global supply of freshwater: The role of treatment wetlands. International Journal of Environment and Sustainable Development, 2(2), 174–183. Link. Keddy, P.A., Fraser, L.H. & Keogh, T.A. (2001). Responses of 21 wetland species to shortages of light, nitrogen and phosphorus. Bulletin of the Geobotanical Institute ETH, 67, 13–25. Link. Keddy, P.A., & Fraser, L.H. (2000). Four general principles for the management and conservation of wetlands in large lakes: The role of water levels, nutrients, competitive hierarchies and centrifugal organization. Lakes and Reservoirs: Research and Management, 5(3), 177–185. Link. Keogh, T.M., Keddy, P.A., & Fraser, L.H. (1999). Patterns of tree species richness in forested wetlands. Wetlands, 19(3), 639–647. Link. Fraser, L.H., & Grime, J.P. (1999). Experimental tests of trophic dynamics: Towards a more penetrating approach. Oecologia, 119(2), 281–284. Link. Fraser, L.H. (1999). The use of microcosms as an experimental approach to understanding terrestrial ecosystem functioning. Advances in Space Research, 24(3), 297–302. Link. Keddy, P.A., Fraser, L.H., & Wisheu, I.C. (1998). A comparative approach to examine competitive response of 48 wetland plant species. Journal of Vegetation Science, 9(6), 777–786. Link. Fraser, L.H. (2011). Atlantis Rose. Kamloops, BC: CiCAC Press. Link. Fraser, L.H., & Keddy, P.A. (Eds.). (2005). The World’s Largest Wetlands: Ecology and Conservation. Cambridge: Cambridge University Press. Link. Gilbert, A.A., & Fraser, L.H. (2016). Effects of competition, salinity and disturbance on the growth of Poa pratensis (Kentucky Bluegrass) and Puccinellia nuttalliana (Nuttall’s Alkaligrass). In M.A. Khan, B. Boër, M. Ȫzturk, M. Clüsener-Godt, B. Gul, & S.-W. Breckle (Eds. ), Sabkha ecosystems. Tasks for Vegetation Science, vol 48 (pp. 349–367). Cham: Springer International Publishing. Link. Fraser, L.H., & Keddy, P.A. (2005). The future of large wetlands: a global perspective. In L.H. Fraser & P.A. Keddy (Eds. ), The World’s Largest Wetlands: Ecology and Conservation (pp. 446–468). Cambridge: Cambridge University Press. Link. Keddy, P.A., & Fraser, L.H. (2005). Introduction: big is beautiful. In L.H. Fraser & P.A. Keddy (Eds. ), The World’s Largest Wetlands: Ecology and Conservation (pp. 1–10). Cambridge: Cambridge University Press. Link. Fraser, L.H., Carty, S., Picard, C. and Steer, D. (2004). Phytoremediation: Wetland plants and their relative efficiency at treating agricultural runoff. In S.G. Pandalai (Ed. ), Recent Research Developments in Crop Science (pp. 379–391). Kerala, India: Research Signpost. Keddy, P.A., & Fraser, L.H. (2003). The management of wetlands for biological diversity: Four principles. In R.S. Ambasht & N.K. Ambasht (Eds. ), Modern Trends in Applied Aquatic Ecology (pp. 21–42). Boston, MA: Springer US. Link. Fraser, L.H. (2001). [Review of the book Seventh catalog of the vascular plants of Ohio, by T.S. Cooperrider, A.W. Cusick & J.T. Kartesz]. Ohio Journal of Science, 102(3), 63. Link. Fraser, L.H. (1998). [Review of the book Plant functional types: Their relevance to ecosystems properties and global change (International Geosphere-Biosphere Programme Book Series 1), by T.M. Smith, H.H. Shugart & F.I. Woodward]. The Canadian Botanical Association Bulletin, 31(4), 65–66. Link. Antonelli, P.M., Fraser, L.H., & Gardner, W.C. (2016). Growth response and metals uptake of native bunchgrasses during organic amendment-assisted phytostabilization of alkaline mine tailings. British Columbia Mine Reclamation Symposium, 139–153. Penticton, BC. Link. Fraser, L.H., Garris, H.W., Baldwin, S.A., Van Hamme, J.D., & Gardner, W.C. (2015). Using genomics in mine reclamation. In A.B. Fourie, M. Tibbett, L. Sawatsky and D. van Zyl (Eds. ), British Columbia Mine Reclamation Symposium in conjunction with Mine Closure (pp. 1–12). Vancouver, BC. Link. Baethke, K., & Fraser, L.H. (2014). The effect of site preparation on the establishment of native grassland species in southern interior. British Columbia Mine Reclamation Symposium. University of British Columbia, Vancouver, BC. Link. Phillips, M., Gardner, W., Fraser, L.H., & Karakatsoulis, J. (2014). Effect of soil amendments (mats and hydroseeding) on establishment success of four native grassland species. British Columbia Mine Reclamation Symposium. University of British Columbia, Vancouver, BC. Link. Harrower, W.L., Fraser, L.H., & Turkington, R. (2014). Trophic cascades and detrital subsidies in montane temperate grasslands. 99th ESA Annual Meeting. Sacramento, CA. Link. Fraser, L.H. (2011). Adaptation to climate change in temperate grasslands. In The International Symposium on the Human Dimensions of Ecological Conservation in the Tibetan Plateau region (pp. 109–137). Xining, Qinghai, China. Fraser, L.H. (1996). Plant/animal interactions: The effects of invertebrate herbivory and productivity on plant community dynamics examined in outdoor microcosms and two North Derbyshire dales (Doctoral dissertation, University of Sheffield, Sheffield, England). Link. Fraser, L.H. (1993). The influence of salal on planted hemlock and cedar saplings on northern Vancouver Island (Master’s thesis, University of British Columbia, Vancouver, BC). Link. Harrower, B., Fraser, L.H., & Turkington, R. (2013). Grassland trophic dynamics in a changing world. Canadian Society for Ecology and Evolution Bulletin, 14, 15–16. Link. Cox, M. and Fraser, L.H. 2012. Climate change and BC Range. Centre for Community and Ecosystem Ecology booklet. Harrower, W., Fraser, L.H., Cowie, A. 2012. Storing sunshine for a rainy day: towards the development of a made-in-British Columbia carbon offset program. BC Grasslands Conservation Council brochure. Fraser, L.H. , Larsen, K., Gardner, W. 2010. A travel through time: towards a grassland research and stewardship (GRAS) centre. BC Grasslands, Winter 2009/2010: 5-6. Fraser, L.H. 2008. Research at TRU. BC Grasslands, Summer 2008: 8. Jones, M.W., Fraser, L.H., Thorne, S., Harrison, B. (2008). Effects of livestock grazing in southern interior wetlands: Interactions with amphibians, benthic macroinvertebrates, vegetation, and breeding waterfowl (Forest Investment Account Project Y081232). Link. Fraser, L.H. 2007. 100 Mile House Industrial Hemp Project. First Nations Development Agrologist, B.C. Ministry of Agriculture and Lands. 13 pp. Carlyle, C. and Fraser, L.H. 2007. Measure of grassland vegetative cover using digital images. B.C. Ministry of Environment. 16 pp. Rankin, M.L., Larsen, K. and Fraser, L.H. 2007. Implications of the effects of cattle grazing on small mammals. B.C. Ministry of Environment. 20 pp. Jones, W.M., Harrison, B., and Fraser, L.H. 2006. Effects of cattle grazing on wetland parameters important to breeding waterfowl in the Southern Interior of BC. Institute for Wetland and Waterfowl Research. 19 pp. Fraser, L.H. and Landis, F. 2006. Wetland monitoring protocol for indicators of ecosystem health, Cuyahoga Valley National Park, Ohio. U.S. Dept. of Interior, National Park Service. 114 pp. Fraser, L.H. 2004. Developing Indicators for the Assessment of Wetland Health in the Cuyahoga Valley National Park. U.S. Dept. of Interior, National Park Service. 30 pp. Interviewed by Chris Walker, CBC Daybreak, March 1, 2012, on the importance of grasslands with respect to the Ajax mine proposal (‘Mining the neighborhood’). Donna Fleury, January 16, 2012. Ranching and carbon sequestration. An Online article published on Farmcentre.com – The Canadian Farm Business Management Council Website. Interviewed by RadioNL, Sept 6, 2011, on Canadian Environmental Assessment Agency funding to GCC regarding Ajax mine proposal. Robert Koopmans. 2011 (July 30). Ajax will forever change the Jacko Lake grasslands. Newspaper article in Kamloops Daily News. Pollon, Christopher. 2011 (June 22). Back home on the range: an ecologist returns to Canada to protect the wetlands and grasslands he loves. Canadian Foundation for Innovation. Innovation Canada – Showcasing research excellence in Canada. Link to Article . Interviewed by RadioNL, May 20, 2011, on ATV use in grasslands. Interviewed by RadioNL, Angelo Iacobucci, March 9, 2011 on Climate change research in Lac du Bois Provincial Park. Interviewed by RadioNL, Angelo Iacobucci, March 9, 2011 on Grasslands Conservation Council. Newspaper article in Kamloops Daily News, April 26, 2010 on the BC Naturalist Conference. Interviewed by CFJC TV7, April 9, 2010 on BCKDF award. Interviewed by local Kamloops Radio on BCKDF award, April 9, 2010. Newspaper article in Kamloops Daily News, April 10, 2010. Newspaper article in The Omega, Wednesday, October 11, 2009. ‘First two MSc. In Environmental Science students graduate TRU’. Interviewed by CFJC TV7 on Midday News, September 5, 2009, regarding CRC renewal. Newspaper article in Kamloops Daily News, September 29, 2009. ‘Exceptional TRU research renewed as CRC’. Gayton, Don. 2009. Grazing, grass, and climate: unpacking the relationships. LINK FORREX 10(4): 3. Newspaper article in Kamloops Daily News, March 31, 2009. Hebert, Percy (Editor) 2009. Discover – News from TRU Faculty of Science, Spotlight on Faculty. Winter Edition 2008/09, Volume 1, Issue 1, page 5. Newspaper article in Kamloops Daily News, September 25, 2008, ‘Kamloops carbon-tax supporters to advise government, educate public’. Newspaper article in Kamloops Daily News, June 4, 2008, ‘TRU hopes for Chinese in new program’. Newspaper article in Kamloops Daily News, April 19, 2008, ‘$1-million grant to help research region’s industry’. Interviewed by local Kamloops Radio and by Kamloops Dails News regarding my appointment to the Citizens’ Conservation Council on Climate Action in September 2008. Interviewed by CFJC TV7 in Kamloops regarding a research agroforestry project in March 2008. Newspaper article in Kamloops Daily News, January 22, 2008, ‘Student’s award a credit to TRU’. Newspaper article in Kamloops Daily News, January 18, 2008, ‘TRU student joins elite circle’. Leech, Susan. 2008. What’s new in rangeland research? Highlights of projects funded through the Forests Investment Account – Forest Science Program. Beef in BC 22(5): 19-20. Newspaper article in Kamloops Daily News, May 19, 2007, ‘Root of all weevil; six-legged terminator helps ranchers battle imported plants’. Thorne, Susan. 2007. FIA-FSP aims to develop knowledge and deliver results on riparian issues. LINK FORREX 9(2): 6-9. Newspaper article Kamloops Daily News, April 18, 2007, ‘Master’s program approved for TRU’. Newspaper article in Kamloops Daily News, April 14, 2007, ‘TRU students study cattle grazing habits’. Newspaper article in Kamloops Daily News, March 19, 2007, ‘TRU faculty hope to master the arts: Program aims to get university’s first graduate degree in arts’. Interviewed by local Kamloops Radio regarding a research project involving visual screening in grasslands in March 2007. Interviewed by CFJC TV7 in Kamloops regarding the launch of TRU’s MSc in Environmental Sciences in March 2007. Shaughnessy, Karlie. 2006. Environmental studies graduate program. Insidetru: people, programs & perspectives. Volume 5, issue 2 – spring 2006: 8. Newspaper article in Kamloops Daily News, April 24, 2006, ‘Researcher on the hunt for seized grow-op equipment’. Newspaper article in Kamloops Daily News, April 24, 2006, ‘Educator turns up the heat on climate research’. Skogland, Diana. 2005. A unique university developing original programs. Insidetru: people, programs & perspectives. Volume 4, issue 3 – October 2005: 1. Newspaper article in Kamloops Daily News, July 27, 2005, ‘Province writes cheque for local grassland study’. Newspaper article in Kamloops Daily News, December 7, 2004, ‘Greenhouse gets green light: UCC receives $300,000 in provincial and federal funding for complex’. Newspaper article on CRC appointment to TRU in Kamloops Daily News, April 16, 2004, ‘UCC researcher to focus on wild land restoration’.